In preparing for this week’s Sweet Melissa Sundays recipe, I kept reminding myself to buy bananas early enough to allow them to get nice and ripe. I meant to buy them before I left for Las Vegas last Sunday, but forgot. In preparing for a getaway to Vegas is remembering to stop at the store to buy bananas high on anyone’s list? I’m glad I stumbled on Twitter at just the right time when fellow bakers were discussing the oven trick for ripening the bananas. I didn’t read the details about the oven trick, just read the words “oven trick” and “bananas”. I stuck my bananas in oven while it was preheating and took them out when it beeped. Other than the oven trick, I halved the recipe and made 8 regular sized muffins. The trick to this banana bread is the addition of apples carmelized with brown sugar, cinnamon, and vanilla. Yummilicious! Thank you to Joy of Hot Oven, Warm Heart for selecting Mom’s Bananna Apple Bread. For the recipe, visit her blog or buy the book. I think muffins were definitely the way to go this week or maybe great minds just think alike? 🙂 Yours look perfect! I agree about the apples – they take this recipe over the top and keep the bread so moist! Cute muffin. I really enjoyed this recipe. 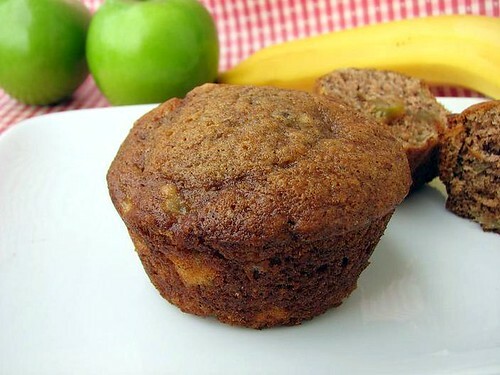 I love bananas and muffins and these look great. Awesome to know about the oven trick. I had no idea. Nice muffins, that was a new trick to me as well. Muffins are a great idea! I’m loving the muffin version of this recipe, and the “oven trick” is news to me, too. Love your muffins! I used the oven trick too, and it worked perfectly. Such a handy thing to know. I try to keep bananas in the freezer for my baking adventures. These look great! Great idea to help them ripen, I didn’t know that trick. I love the idea of apple in with the banana, yum! Muffins are such a great idea for this recipe. Mental note for next time! Love the muffins, they look so good. I agree, the bread was very moist. Yum, these muffins look great. I need to jump on the bandwagon and make these! How are you- did you have a wonderful time on your trip? Thank you so much for baking along with me this week! I’m really glad to hear you enjoyed the recipe! I’m sorry I didn’t have a chance to stop by and comment sooner- I’ve been really under the weather for the past two weeks, so unfortunately I haven’t been on the computer too much… but I’m glad I had the chance to read your post about your gorgeous banana apple muffins. They look absolutely delicious- great job! That’s really neat that you tested out the oven trick- do you think it mimicked the taste of ripened bananas? I hope you’re doing well- have a great rest of your week! Hope to hear from you soon! Argh Vegas!! I’d love to go to Vegas! MMMMMMMMMM,…the muffin looks so tasty!! Now, I want to eat at least 3!